It’s been a privilege to meet and work with so many talented film professionals and actors throughout this project, which launches later this week. We worked hard all day for two days of shooting in New York, but did have a chance to relax and get to know each other over lunch. 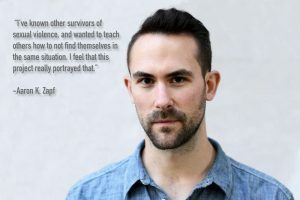 Many of these folks have seen the impact of sexual violence play out in their lives and relationships, and found these videos as a way to tangibly contribute to making the world better for survivors. You can check out all of the actors on our Partners page, and we’ll be celebrating them on social media throughout the fall. Russ Hammonds: If you’ve watched my TEDx talk, you know that Russ is my best friend in the world. Lucky for me, he’s also a writer and master of all things television production. He worked tirelessly to organize two days of shooting in New York, and showed me how to put something like that together in a professional way. Aaron Zapf: Aaron has many talents, but there was one he didn’t bring to the video shoot: parkour. I’m still trying to convince him to film a video about how to talk about sexual violence while flipping yourself over a bush or something. Kidding aside, Aaron was awesome, and you can see his work in a number of the videos. 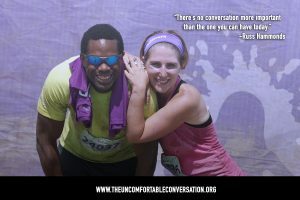 Stay tuned for more profiles of the fabulous cast from The Uncomfortable Conversation, Inc.!